Rocks!! member Lynn Stubbings ran her fastest half yet in Whitby on Sunday. Hot after completing her 50th half marathon in Sudbury the previous week in just under 2:16 she took on the course with a mission. The result - a new fast time in 2:10:02. Her finishing comment: "I really feel good". Next up, the Banff Alberta Half Marathon in June. Rocks!! and Masters runner Jesse Winters admitted "this is as close to gold as I can get" . 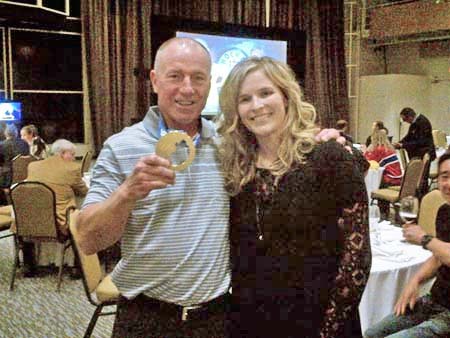 He was fortunate to meet Olympic curling gold medalist Jennifer Jones at a National Bank Financial conference. She let him fondle the medal but balked when he asked to bite it. Some people were raised to fear God; I was raised to fear women, and although it was not an intentional parenting strategy it was the inevitable result of being raised with three athletically and aggressively disposed sisters, by a mother who, following a brief tenure as a kindergarten teacher returned to school, and earned her MBA. The influence of being raised by and among powerful women played out in a myriad of ways. I learned early on that although I was the third born, I was destined to place fourth in all the things that mattered as a kid, as well as many of the things that didn’t. Whether it was alpine skiing, tennis, hockey, casually shooting hoops in the driveway after school or playing the Game of Life on Saturday nights, though I could occasionally steal a win, this was the exception and not the rule. In spite of this, it was a good way to grow up and I both loved and revered my sisters’ capacity to contend. It wasn’t just that they won almost everything; it was how they competed. This intensity profoundly impacted my life growing up. My sisters had a way of making my problems go away whether it was an issue with a bully in elementary school, a girlfriend who broke my heart or the travails of Grade 11 math. Suffice it to say I spent the formative part of my life regularly being chick’d well before the term came to define the finish line phenomena of a man getting passed by a woman. If anything, the concept, beyond its inherent sexism, seems on the benign side of what the women I grew up around were capable of. Had my sisters been interested in distance running I have no doubt that their first inclination wouldn’t have been merely passing the person in front of them but running them over in the process. I like to think that I too have some of this fire. As an adult I have gauged the success of a race by my time and place but also by my position in relation to the women with the bibs adorned with low numbers and their nation’s flags. I have run 30K with Canadian marathoner Jutta Merilainen, only to relent and crumple when she insisted that the reward for finishing with time to spare was an additional 8K. I have felt intimidated after looking at what Katie Snowden does in a week of concurrently training for the triathlon and marathon. And my lasting claim to fame won’t be any fleeting personal best or a small-town win but my arm appearing in the corner of a Katherine Ndereba photo as she passed me in the final meters of the Montreal Half-Marathon. Running’s a big tent and there are as many reasons to race as there are people in the sport. However, make no mistake, worrying about being passed while charging for the finish line matters. It’s a race and anyone lucky enough to have earned the dubious distinction of leading for any length of time will attest to the fact that being pursued changes things dramatically. However, concern in some dark corners of the male psyche regarding being passed by a female, beyond being shallow and disrespectful to women who have earned their place the hard way is irrelevant to me. I don’t want to be passed by anyone. But when it does happen I want to know why. The question of whether they are a man or a woman or some guy dressed as a giant banana isn’t important to me. What is important is how they did it. I want to know what they did for training, the mileage they did in the weeks prior to the race, the shoes they wore, the name of their coach, how long they regularly slept at night and what they ate for breakfast. Over the years I have been motivated by time and in some events, by my standing but ultimately I am driven by the primal compulsion to pass the man, woman or child in front of me. It’s how I was raised. Note: Everybody got chick'd in the 2014 CIS SudburyRocks!!! Marathon as North Bay resident Angela Batsford beat the field by a full 9 minutes on May 11. She crossed the finish line in 3:09:49. Join us for a great time and a great cause! We are hosting a 2 km and 5 km walk or run through Minnow Lake Place in support of the Defeat Depression campaign. I hope you all enjoyed the long weekend , and for those of you racing this weekend good luck! Before your next race be sure to stop by and take advantage of some great sales on Running Room apparel and shoes! 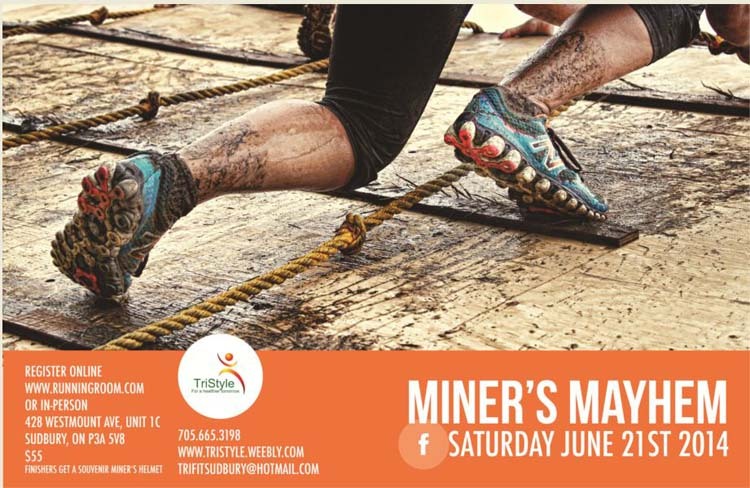 Registration is now open for this year's 20 minute challange, sign up for FREE online!